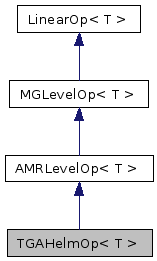 Implemented in AMRPoissonOp, ResistivityOp, VCAMRPoissonOp, VCAMRPoissonOp2, ViscousTensorOp, EBAMRPoissonOp, EBConductivityOp, and EBViscousTensorOp. Referenced by AMRTGA< T >::resetAlphaAndBeta(), and BaseLevelTGA< T, TFlux, TFR >::resetSolverAlphaAndBeta(). Set the diagonal scaling of the operator. If you are solving rho(x) dphi/dt = L(phi), this would mean multiply by rho. In EB applications, even for constant coefficients, it means to multiply by kappa. Implemented in AMRPoissonOp, ResistivityOp, VCAMRPoissonOp, ViscousTensorOp, EBAMRPoissonOp, EBConductivityOp, and EBViscousTensorOp.